"Una's classes are magical. Expect everything from Irish folk to reggae, seasonal favourites to stomping and dancing, songs to learn your days, months, phonics, numbers - she has thought of everything, and even throws in the odd bit of Bob Marley/ Cyndi Lauper/ Soul Asylum etc to keep the parents happy! All brought to life with train whistles, bells, drums, swanee whistles, bouncing teddy bears, sticks to clack and bang (or chew :-) ), all accompanied by Una's beautiful guitar. I started taking my son when he was around 4 months old and, a year later, we still go as often as we can. A good sing-a-long puts us both in a great mood for the day!" "I found out about Una’s Guitar Girl SingAlong online and I’m so pleased I did. My toddler son and I look forward to it every week and we come away learning a new song each week. Una is so enthusiastic and puts a lot of effort into varying the theme each week!" "Excellent singalong! My daughter thoroughly enjoyed herself and so did I! Different to all the other music classes – much more fun and interactive!" ""Really enjoyable and lively… We come not just for the fun, but to help develop rhythm and language skills." "I always heard that music was great for a child's development and I wanted to foster a love of music in my son from an early age - and who doesn't love a good singalong? These classes are SO wonderful! I'm amazed every week by the attention to detail and the amount of planning Una must do to ensure each session is engaging, interactive and fun for children and adults alike! It is certainly a highlight of our week and the variety of themes provides a great opportunity to sing classics, learn new songs (vital for a parent's repertoire!) and for children to learn more about the world around them in such an enjoyable way. I would not hesitate to recommend Guitar Girl Singalongs and if my 10 month old could talk he'd say it's awesome, too - in the meantime, he gives it lots and lots of claps!" "The best music class in Kingston! My daughter and I love Una's class, the variety of songs and themes is a cut above other music classes and a must for anyone bored with the same old 'wheels on the bus' style songs. My daughter loves having the freedom to crawl around while rocking away with Una and I enjoy listening to and joining in with the songs." ﻿"We absolutely love this class, it has the right mixture of fun, singing and storytime to keep toddlers and babies alike amused. Una has a lovely soothing voice which adds a sense of calm to our ordinary, busy lives. I would definitely recommend to a friend." "Your new CD is absolutely brilliant and Ewan loves it. Especially The Pirate ship song and the Fireworks song!! My 7 month old baby nods along to it too which is hilarious!!! We have really fun car journeys since your CD arrived!" "Wonderful! We enjoyed it as much as our grandchildren do." "This session is something we look forward to every week. It's lots of fun and the interaction with all the children is brilliant. We love it so much that when I go back to work, I am trying to take Fridays off." "Una - your toddler classes are simply fabulous. I can't thank you enough. Dakota loves coming every week. Your classes are fun and original. You are ever so talented." "We just listened to your cd in the car - what a treat! The boys loved it and I love all the ad libs and harmonies! It's very beautiful and sure to be a favourite!" "April absolutely loves going to the sessions and gets very excited when I say we are off to see Una. We love dressing up to the themes and the music is of excellent quality and is tailored to each class. Una is very talented and has a real way with kids. April's musical abilities have come on leaps and bounds with this babies and toddlers music class. Thank you Una." "Una's wonderful CD was great company and the children loved it! It made all the driving for Christmas visits much shorter and super fun!" "My son has a wonderful time at Una's singalong music classes. He has gained so much confidence and loves the different weekly themes. Una is a natural with the kids and brings out the best in their musical abilities." 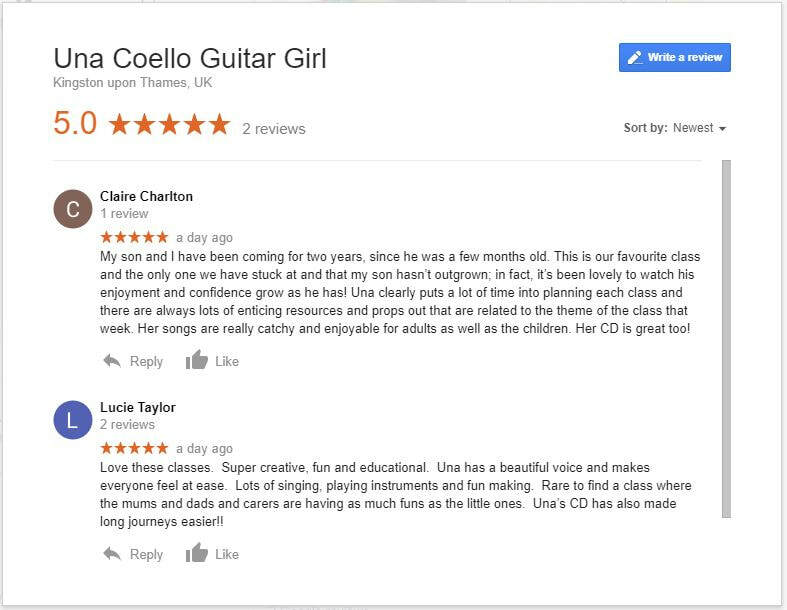 "Such a lovely music class - a great mix of gentle and energetic songs and it is really special to have the live guitar. Una creates a very welcoming and relaxed atmosphere."